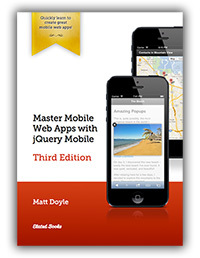 jQuery Mobile 1.3: What's New? As of 1.3, jQuery Mobile focuses more strongly on responsive web design. With this technique, your webpage adapts to different devices and browsers. For example, when viewed on a desktop browser, your page might include a main content column on the left side of your page and a sidebar column on the right. On a mobile phone, however, those columns would be stacked one below the other, to better accommodate the reduced screen width on mobile devices. Find out more about responsive web design, and how to build responsive page layouts. jQuery Mobile takes a “mobile first” approach to responsive design. While it’s primarily built for mobile devices, the framework makes it easy for your page layout to adapt to everything from mobile phones through to tablets and desktops. jQuery Mobile 1.3 helps you build responsive layouts in many different ways, which you’ll explore in the following sections. Let’s start by taking a look at some responsive design tips, as well as the concept of breakpoints, which are key to responsive design. Flexible images and other elements. The article also goes on to explain some “mobile first” best practices for good responsive design, and shows how to use jQuery Mobile to build a simple mobile-first responsive layout. Breakpoints are a key concept of any responsive layout. A breakpoint is a specific browser width — usually in pixels or ems — at which the layout changes. Browsers narrower than the breakpoint display one version of the layout optimised for narrower screens; browsers wider than the breakpoint display a layout better suited to wider screens. A responsive layout typically has at least one, but sometimes as many as three, breakpoints. To specify a breakpoint, you typically use the CSS media queries min-width and max-width. With jQuery Mobile you usually specify the breakpoint width in ems, rather than pixels. You’ll see some breakpoint examples in the following sections. While you are encouraged to set your own breakpoints to match your particular site’s design, many of jQuery Mobile’s widgets feature preset breakpoints, which make it easy to create responsive widgets just by adding various CSS classes to them. You’ll look at these in the following sections too. jQuery Mobile already features a simple layout grid system: Just create a containing element with a ui-grid-* CSS class, then add ui-block-* classes to each element inside the grid. A responsive grid in action. The grid elements stack vertically in narrow viewports (top) and stretch across the page in wider viewports (bottom). If you don’t want the hassle of creating your own media queries, jQuery Mobile comes with a preset media query for responsive grids. Simply add the class ui-responsive to a <div class="ui-grid-*"> element to make the elements stack vertically below 560px (35em), and sit side-by-side at 560px and above. Find out more about responsive grids. Responsive tables are a new core feature of jQuery Mobile 1.3. These allow you to display a large amount of tabular data in a way that looks good and functions well on both desktop and mobile browsers. There are two modes for responsive tables in jQuery Mobile: reflow and column toggle. This is the default setting. It vertically stacks the table cells in each row, and adds some vertical space between the rows. This makes the table readable on a mobile phone (following the “mobile first” philosophy). It’s then up to you to add a suitable media query to make the table display in the traditional row/column format above a particular browser width. A reflow mode table. Each row’s cells stack vertically in narrow viewports (top). In wider viewports, the table displays in the usual way (bottom). As with responsive grids, jQuery Mobile comes with a preset media query for reflow tables which you can use instead of creating your own media query. Add the ui-responsive class to a <table> element to make the cells in each row stack vertically below 560px (35em), and sit side-by-side at 560px and above. This table mode takes a different approach. You create a column toggle table by adding the data-mode="columntoggle" attribute to the table element. Then you can give each th element in the table a data-priority attribute (1=highest, 6=lowest). jQuery Mobile then progressively shows columns from the table, in order of priority, as the browser viewport widens. So, while all columns are visible on a desktop browser, only the most important columns are shown on a mobile phone. In addition, jQuery Mobile adds a “Columns…” button to the table that lets the user choose which columns they’d like to see. If you don’t assign a data-priority attribute to a column, the column is always shown. Once you’ve created your column toggle table, you need to add media queries to your CSS that show and hide the columns at your chosen viewport widths, according to priority. 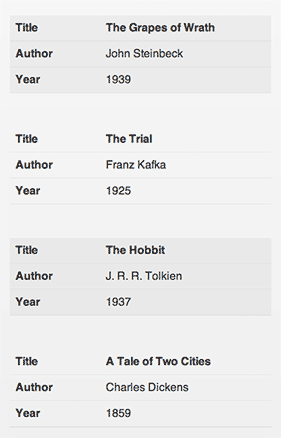 Here we’ve created a #bookList table with the data-mode="columntoggle" attribute to specify a column toggle table. We’ve given three of the the columns data-priority attributes. The Title column is always shown, even at the narrowest viewports. As the viewport gets wider, the other three columns progressively appear: Author first, followed by Price, and finally Year. Here we’ve added media queries to show priority 1 columns at viewports 25 ems and wider; priority 2 columns at 35 ems and wider; and priority 3 columns at 45 ems and wider. We’ve also added a couple of extra media queries; these are required to ensure that the Columns button functions properly. A column toggle mode table. In narrow viewports, only the highest-priority columns are shown (top). In wider viewports, lower-priority columns are shown (bottom). If you’d rather not create your own media queries for your column toggle tables, jQuery Mobile comes with a range of preset media queries for various column priorities. Just add the ui-responsive class to the <table> element. The preset breakpoints are 20em for priority 1 columns, 30em for priority 2, 40em for priority 3, and so on. Find out how to create reflow tables and column toggle tables. The panel widget is new to jQuery Mobile 1.3. A panel is a flexible, easy-to-use widget that slides in from the left or right side of the browser viewport. The user can dismiss the panel by tapping in the page outside the panel, swiping left or right, or pressing the Esc key. Unlike dialogs, panels feel relatively unobtrusive since they don’t take over the whole page. Panels are great for bringing up in-page navigation, as well as for temporary sidebars holding toolboxes, inspectors, and so on. To create a panel, all you have to do is add a data-role="panel" div to your markup and give it an id, such as myPanel. The panel needs to be placed inside the data-role="page" container, either before or after the header, content and/or footer divs. To create a button that opens the panel when tapped, just link to the panel’s id from the button. For example: <a href="#myPanel" data-role="button">...</a>. data-display="reveal" makes the panel sit under the page. The page slides to reveal the panel. This is the default setting. data-display="overlay" makes the panel float on top of the page. data-display="push" shows the panel by sliding both the page and the panel as one. You can also choose whether the panel appears on the left or right by adding data-position="left" or data-position="right" to the panel container. The default is "left". As with popups, panels come with very minimal styling by default. It’s up to you to style the content inside the panel. 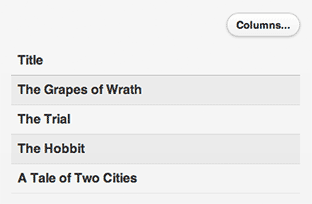 However, like all jQuery Mobile widgets, you can set a panel’s swatch (colour scheme) using the data-theme attribute. Adding the data-rel="close" attribute to an element tells jQuery Mobile to close the panel when the user taps that element. Press the button below to see this panel in action. 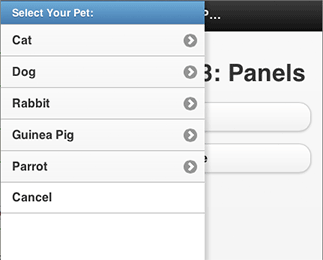 Press the Pets button to open the panel, then select an option in the list (or tap outside the panel) to close the panel again. Panels are a useful, unobtrusive way to add additional navigation or options to a page. If you add the class ui-responsive-panel to the data-role="page" element containing a panel, the page content reflows to make room for the panel if the viewport is wider than 880px (55em). This lets the user read both the panel and the page at the same time. Read more about the new panel widget. jQuery Mobile 1.3 now supports range sliders with two handles, which are handy for selecting minimum and maximum values. To create a two-handle range slider, you need to create two <input type="range"> elements — one for each handle — then wrap them in a div with a data-role="rangeslider" attribute. jQuery Mobile now supports range sliders with two handles — great for specifying minimum and maximum values. As well as supporting dual-handle sliders, the jQuery Mobile team have refined the look of the input fields next to the slider track so that they are smaller and less obtrusive. You can also now use values less than 1 — for example, 0.01 — for the step attribute, letting you create finer-grained sliders. Learn more about creating and customising sliders. jQuery Mobile’s Ajax navigation system lets the user navigate between pages without having to reload the whole page each time. To track the current page in the address bar, it uses the browser’s history.replaceState() method and the popstate event on newer browsers, falling back to adding hashes to URLs and using the hashchange event on older browsers. The returned data object also contains a state object with some useful properties, including url (the current URL), hash (the current hash portion of the URL) and direction ("forward" or "back"). Find out more about the navigate() method and navigate event. jQuery Mobile 1.2 introduced a new listviewbeforefilter event that allows you to create an “autocomplete” listview using data that is either local (embedded in the page), or pulled from a remote data source using Ajax. Here’s a demo of this technique, and I also include a demo using local data in my jQuery Mobile book. Create your listview as normal, including all the possible options in the list. Add the data-filter="true" and data-filter-reveal="true" attributes to the listview. data-filter-reveal="true" tells jQuery Mobile to hide all the list items by default. Then, when the user types some characters into the filter box, only the matching items are revealed. Using the data-filter-reveal attribute, you can easily create an autocomplete listview with local data. Read more about autocomplete listviews. Dialogs have a new data-close-btn attribute to control the “close” button in the dialog header. data-close-btn="right" moves the button from the left to the right hand side, while data-close-btn="none" removes the button altogether. You can also now use the data-corners="false" attribute to easily remove the rounded corners from a dialog. The new data-close-btn and data-corners attributes let you create dialogs with no close button and square corners. Find our more about dialogs and popups in jQuery Mobile 1.3. The “clear” button (a little “X”) that previously only appeared in search fields can now be added to any textual input field (but not textareas). Just add the data-clear-btn="true" attribute to the input element. You can set the hidden text on this button using the data-clear-btn-text attribute. Finally, you can also remove the “clear” button from search fields using — you guessed it — data-clear-btn="false". More mobile browsers now support the <input type="file"> input for file uploads. jQuery Mobile now styles these automatically to match the other input types. You can even use the data-clear-btn="true" attribute to add a “clear” button to file inputs. Text inputs now look better on IE9 and Windows Phone; textareas now “auto-grow” when you paste text into them (previously this only happened when manually typing); and text inputs now handle multibyte (e.g. UTF-8) strings better. Add data-clear-btn="true" to any text input — such as this <input type="email"> field — to add a “clear” button to the field. data-icon="bars" produces a “three horizontal bars” icon — useful for “menu” buttons in headers. data-icon="edit" produces a “pencil” icon, which is useful for “edit” buttons. You can also now easily specify an icon from the alternate (black by default) icon set by adding the CSS class ui-icon-alt to the element, as well as remove the disc around an icon by adding the ui-icon-nodisc class. New icon options: data-icon="bars", data-icon="edit", the ui-icon-alt class, and the ui-icon-nodisc class. As with many other widget types, you can now add data-corners="false" to a data-role="collapsible" or data-role="collapsible-set" container to remove the rounded corners from a collapsible block or collapsible set. jQuery Mobile’s fixed header and footer bars remain in place at the top and bottom of the browser viewport as the user scrolls the page. Since older mobile browsers (particularly on Android) don’t handle fixed elements well, jQuery Mobile includes a lot of tweaks and workarounds to get fixed toolbars working satisfactorily on these browsers. jQuery Mobile 1.3 adds even more fixes, and also packages them into an extension called fixedToolbar.workarounds.js. You can exclude this extension in the download builder if you want to save bandwidth and don’t mind not supporting these older browsers. You can now extend three methods that are associated with the swipe event: start, stop, and handleSwipe. This lets you customize the way that swipe events are handled and processed. See the Swipe API for details. As of 1.3, the jQuery Mobile documentation has been split into two sites. The API documentation contains detailed information on each widget and its associated options and methods, as well as global events and methods and a handy data- attribute reference. Meanwhile, the new demo centre gives a general overview of jQuery Mobile’s features, with lots of hands-on demos that show you how to use the features. An increased emphasis on mobile-first, responsive web design. Responsive grids for easier responsive layouts. New responsive tables with two modes: reflow and column toggle. A new panel widget that slides in from the left or right side of the viewport. Improvements to range sliders, including dual-handle sliders, an improved look, and better step attribute support. A new navigate() method and navigate event to make cross-browser Ajax navigation simpler to work with. A new data-filter-reveal attribute for listviews to make it easy to build autocomplete lists. More dialog options to control the “close” button and rounded corners. A new data-dismissible attribute to prevent popups (and panels) closing when the user taps outside them. Enhancements to form fields, including clear buttons in any text input type; styled <input type="file"> fields; and improved styling and functionality for text inputs and textareas. Two new icons, bars and edit, as well as CSS classes for displaying icons from the alternate set and hiding the discs around icons. You can now turn off rounded corners on collapsible blocks and collapsible sets. Fixed toolbars now work better on older mobile browsers, and you can optionally remove the fixed toolbar workarounds from your jQuery Mobile download. The swipe event is now more flexible thanks to three new extensible methods. Last — but by no means least — a fantastic new API documentation site and a new demo centre for showing off jQuery Mobile’s features!